Refer to DTC P0010 (See page ). The valve timing is stuck at a certain value when in the advance range (1 trip detection logic). The valve timing is stuck at a certain value when in the retard range (2 trip detection logic). The ECM optimizes the intake valve timing using the Variable Valve Timing (VVT) system to control the intake camshaft. The VVT system includes the ECM, the camshaft timing oil control valve assembly and the VVT controller (camshaft timing gear assembly). The ECM sends a target duty-cycle control signal to the camshaft timing oil control valve assembly. This control signal regulates the oil pressure supplied to the VVT controller. The VVT controller can advance or retard the intake camshaft. If the difference between the target and actual intake valve timing is large, and changes in the actual intake valve timing are small, the ECM interprets this as the VVT controller stuck malfunction and stores a DTC. DTC P0011 (Advanced Cam Timing) is subject to 1 trip detection logic. DTC P0012 (Retarded Cam Timing) is subject to 2 trip detection logic. Input the DTC: P0011, P0012. DTC P0011 or P0012 may be stored when foreign objects in the engine oil are caught in some parts of the system. The DTC will remain set even if the system returns to normal after a short time. Those foreign objects may then be captured by the oil filter. If any DTCs other than P0011 or P0012 are output, troubleshoot those DTCs first. (e) Enter the following menus: Powertrain / Engine / Active Test / Control the VVT Linear (Bank 1). (f) Check the engine speed while operating the camshaft timing oil control valve assembly (for intake camshaft) using the Techstream. DTC P0011 or P0012 may be stored when foreign objects in the engine oil are caught in some parts of the system. The DTC will remain stored even if the system returns to normal after a short time. These foreign objects may then be captured by the oil filter. 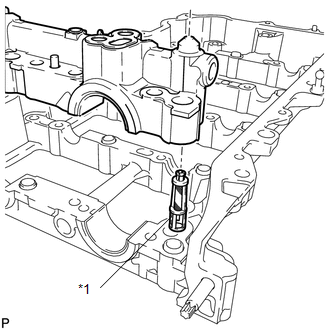 (a) Inspect the camshaft timing oil control valve assembly (for intake camshaft) (See page ). (a) Remove the cylinder head cover (See page ). (b) Turn the crankshaft pulley, and align its groove with the timing mark "0" of the timing chain cover. 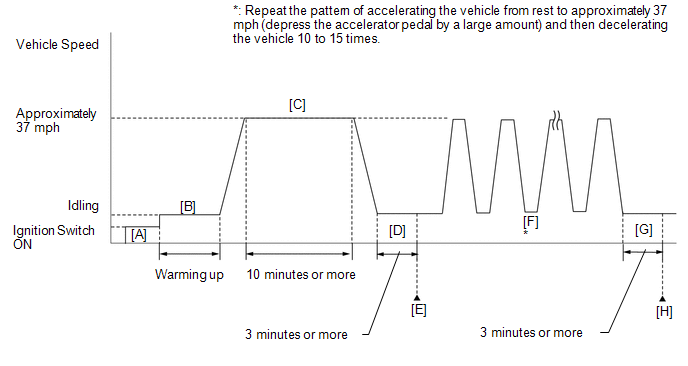 (c) Check that the timing marks of the camshaft timing gears are aligned with the timing marks as shown in the illustration. If the timing marks are not as shown, turn the crankshaft one revolution clockwise. Timing marks on camshaft timing gears are aligned as shown in the illustration. (a) Remove the oil control valve filter (See page ). (b) Check that the filter is not clogged. 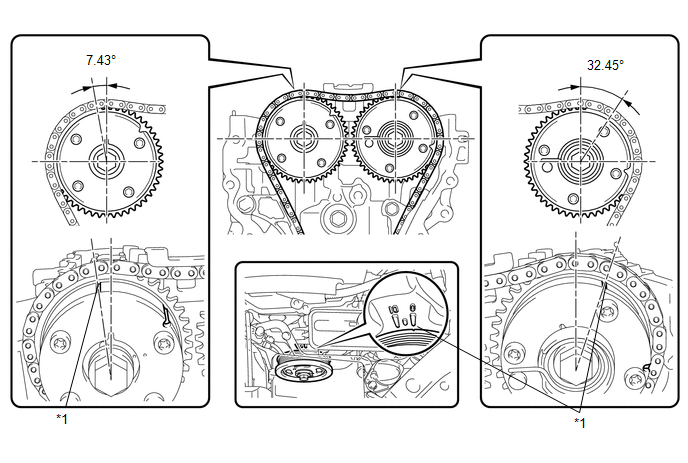 (a) Replace the camshaft timing gear assembly (See page ). Perform "Inspection After Repair" after replacing the camshaft timing gear assembly (See page ). (a) Check for mechanical malfunctions that affect the valve timing, such as a jumped tooth or stretching of the timing chain.